My birthday isn’t until April, but I already bought a present for myself. 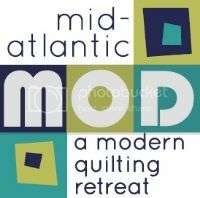 A couple months ago Katie over at Swim Bike Quilt announced that a modern quilting retreat was coming to Lancaster. I’m too far away from the Philly Modern Guild to become an active member, but this retreat is practically in my backyard. And, it starts on my birthday. Fantastic. It takes drastic circumstances for me to cancel class, but let me tell you, as I’m planning my syllabus for next semester, I’m planning an activity for that day that students can complete without me. To force myself to go the retreat several hours late on my birthday just to teach — too cruel; we need to have an alternative class plan. The three guilds sponsoring the retreat opened up registration to their members first (and rightly so), but I was waiting all through October and hoping there would be spaces left. When registration opened at midnight on November 1st, I jumped right online. And, then I waited for an email to confirm that I hadn’t been wait listed. Yay! I wasn’t. I think when I’m at the fabric store this weekend I’ll pick up some fabric that I’ve had my eye on. It’ll be great for sewing together this tote to make my cutting mat and rulers portable for the retreat. And, I told one of the coordinators that I’d be happy to put together a list of attractions in the area, so I guess I just have to go revisit the quilt shops around here to jog my memory about what they specialize in, right? I can pick up the fabrics that I need for my bee blocks as I go. That sounds like a plan to me. Is anybody who follows my blog going?